8.13 points at 39 votes (rank 60). 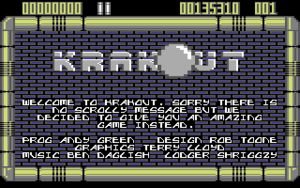 In contrast to Arkanoid or Breakout, the bat in Krakout is not at the lower, but optionally at the left or the right border of the screen. Next to the preferred side, you can also set other details in the menu. Music, sound, effects and a scrolling background graphic can be switched on and off. The starting speed of the ball is fixed by a number between 1 (slow-motion) and 6 (suicide). By pressing the fire button you can also switch to a second speed for the bat during the game. In a game mode menu, you can change the colours for all the sprites and call up special effects. E.g. the full screen shakes with each bounce of the ball or to the beat of the music. 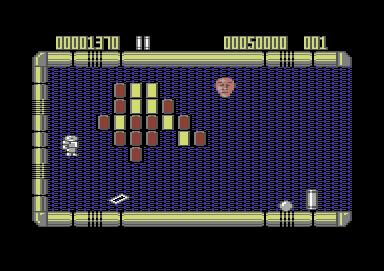 There are exactly 100 screens in krakout (you find 2200 on C64-Games.de). You cannot pick each single screen, but you can play yourself easily to the further screens, when setting an easy difficulty level. Next to the ball, bat and bricks some strange sprites appear, that can have different effects. Some of the friendly ones create a second ball into the game, destroy all stones or let you jump a few screens. The less friendly ones freeze your bat or even swallow the ball. For additional diversification there are special stones, that are marked by a letter. These special stones need to be hit with the ball and the effect stays until you shoot another special stone. 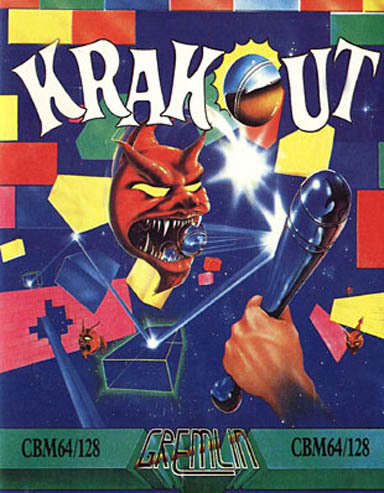 Krakout is, like Arkanoid, a Breakout-clone, so the aim in each of the 100 levels is to hit all the stones with a ball, which has to be kept in the game with the help of a bat. The strengths of Krakout are the tunes, the options and the well-done joystick operation. As usual, there are three outer walls, various aliens and of course different stones. The game area is rather inconspicuous, but the animations are affectionate and the tunes sweeping. 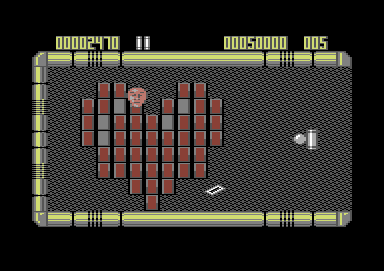 The different aliens have a significantly higher influence on the game as in Arkanoid. After loading and starting the game you find yourself on the title screen. Here the highscore list and the greetings are shown in turns. You also find yourself on the title screen after every game. By pressing fire button you get into the main menu. Set the cursor (flashes) by joystick forwards/backwards to the menu point that you want to change. You then change it by pressing fire and at the same time pulling the joystick forwards/backwards. When you have set everything as you wanted, you press the "SPACE" key to start. None	= no scrolling of the background. Random	= continuous scrolling in one direction. Follow	= scrolling follows the moving direction of the ball. Inertia = bat speed rises while you move the bat. The number of the rest of the bats (that you still have) is calculated from the "Total number of bats" minus "number of lost bats". / to steer the bat fast during "Dual Speed"
There are many types of enemies appearing in this game. Some of them have no effect but most of them have a certain function. The funniest is probably the ball eater (Cannibal), which appears as an inconspicuous blue ball, then enlarges and grabs your ball, eats it with pleasure and spits out the crumpled rest. Special stones can hide behind every block. They get visible after the first hit with the ball. To unfold their effect, they need to be hit with the ball, the effect stays until you shoot another special stone. You can reach a lot of points, when you make it to trap the ball in corners and between edges of undestroyable areas, (Krakout III, the square, where inside only the "egg" gets active and outside are only a few fields). Even though the ball seems to be trapped forever, it will escape after minutes or some hours (!!!!) and it is usually too late when you notice it. FXXS: "In my opinion it is the best Breakout version for joystick players. Especially the different patterns of behaviour of the aliens and the groovy sound give this game its character. 9 points." Anonymous author: "The game should be named more ORIGINAL than anything else which was created until now (2007) in this direction. Dozens of enemies with dozens of options, luscious 100 levels, always new challenges instead of tediously smashing only 150 stones. The hardest thing is not only -as in the "competitor games"- to keep the ball "in", but to properly control it. More fun is not available in a Breakout game!!!!!!" Shakermaker303: "Yes, I can well remember it. The bees, which flew endlessly onto you like a squadron, were rather nerve-wracking. I was always curious, what the next level was going to be built like, as they looked rather nice and partly very coloured. It was very difficult to play the ball controlled and precisely timed onto certain points. 9 out of 10 points for this entertaining game, at least as good as Arkanoid and much better as other clones." TheRyk: "Killer bees and other creatures from a madman's dream attack you while you have essentially little control about which upgrades you activate or not. Daglish at his craziest composed the huge, crazy and awesome music. In case you are still not convinced, you can choose a bunch of gameplay options. I don't know any crazier Breakout than Krakout and cannot vote less than 9!" With the version by "Remember" NO additional levels can be loaded (crash).